Most ISQ readers are aware, at least in an abstract way, of the benefits of standards—among them, systems interoperability, faster time to market, improved productivity, and cost savings. But who among us couldn’t use some help in explaining these benefits in more concrete ways to customers or suppliers or management or colleagues? 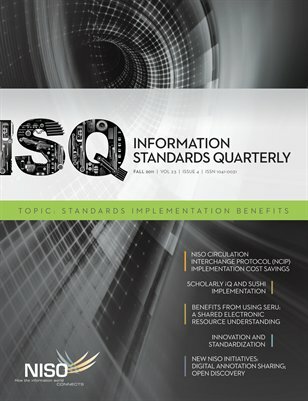 In this issue of Information Standards Quarterly, we focus on several specific examples of the benefits of implementing standards, ranging from savings in staff time to improved customer service and a way to attract new customers.